I am indebted to Ian Lace who has already reviewed other volumes in the series and was kind enough to intercede with Tribute so that I could review these three Herrmann discs. Do have a look at his other Tribute reviews. The advantages of the compact disc medium over the LP are now seen as axiomatic. In a way it is futile to dwell on them because the door had slammed irrevocably shut on vinyl by the end of the 1980s. There's no way back now and most people no longer even consider that there is a 'back' to go to. People in the classical world will think of LPs only in relation to their dwindling value as a source for MP3 transfers for which there is a bustling little market in cheapish turntables, connections and software and perhaps as a sentimental legacy in the loft or storage. The black disc did however have one advantage. It was to do with its size. The 12 inch LP fitted into a 12 inch square sleeve. That was a lot of space to be filled. Classical discs tended to lean on high art for the cover and increasingly, as the performer cult grew, on photographs of the artists. On the reverse of the sleeve there was space for an essay and more photos. Thus was born the liner-note and there followed a gaggle of sages who wrote the notes for a sometimes readership who bought the disc for its audio aspect not for the essay. Eventually the quality of the note became part of the review critics' checklist. LPs of songs or choral works sometimes included an insert reproducing the words being sung or orated and this was slipped into the capacious sleeve. Box sets of LPs often had lavish 12" square booklets with artwork, long texts and libretti. The liner-note was rising to deserve serious consideration and inclusion in bibliographies. Fast forward to the CD and suddenly the physical canvas shrank to a third of its previous size. The CD represented an ultra-convenient 'miniature' format. The bulky 'jewel case' eccentrically offered more protection than the card sleeve to a medium that was more robust than the vinyl it supplanted. It took a while for companies to adjust to the effective use of the booklet and insert. In fact the transition is still imperfect as we know from wrong-headed colour design choices (font on background) and font sizes that are too small to read. Film music LPs began appearing as serious entities in the 1970s. Their arrival at a broader acceptance was signalled by reviews and major label advertising in Gramophone, then a temple to classical music. The vanguard was the RCA Classic Film scores series with outliers from Polydor and a few others. From 1971 to about 1978 George Korngold working with Charles Gerhardt, Sidney Sax and the National Philharmonic produced a series of LPs reviving the music of Korngold, Waxman, Herrmann, Steiner, Raksin, Amfitheatrof, Rózsa and others. These were de luxe re-recordings in state of the art sumptuous orchestral sound. The note writers included Christopher Palmer who was more of a classical music writer but who caught and poetically amplified the mood of the times with his reviews in Gramophone, his books on Howells and Rózsa and his study of Music and Impressionism not to mention his editing and concert realisations of a whole range of otherwise cinema-shackled music: Walton and Prokofiev amongst others. The new generation of RCA LPs - which by the way - deserve systematic reissue of every scrap Gerhardt recorded analogue or not - capitalised on the then latest technology in the studio and in the home. For the hifi brigade without much interest in film itself these discs were de rigueur purchases as audio-strutting material. The acceptance that cinema scores were serious and worthy of in-depth attention prompted the resurrection of scores commissioned and never used. These included Walton's for The Battle of Britain and Alex North's for 2001. What has all this to do with these three discs? The whole de luxe film music movement on LP exploited the vinyl format and packaging to the Nth degree. Stills of the artists, stills from the film, essays, reminiscences, reproductions of film publicity posters - all of these could be found on the reverse of LP sleeves and in lavish inserted booklets. Tribute continue the philosophy in the smaller format of the compact disc but with a few differences. These Tribute CDs are whole score volumes not just the best bits in suites. They use the practised Moscow Symphony and William Stromberg also used by Marco Polo and Naxos in their prolific but now halted film series and they record in Moscow not in London. The CD format is intelligently taken up, with design and visual reproduction qualities of the highest. Documentation is more extensive than that provided in LP days and font size and legibility are cannily handled. These are discs where the knowledge, acumen, skill, care and love of the music are patent. We know that we are in the presence of a series that meant something valuable to those involved. And it shows. Bernard Herrmann is, for me, one of the real greats of film music alongside Korngold. His volume in the RCA Gerhardt series was a Pauline revelation for me - a musical Damascus Road experience with the Waxman album a close second. The Kentuckian is a frontiersman tale rather than a standard cowboy actioner. It starred a young Burt Lancaster. Herrmann's score leans on 'Olde English' material and reportedly draws on music he wrote in the 1930s for a CBS radio dramatisation of Housman's "A Shropshire Lad". Herrmann was after all a passionate and erudite Anglophile. The highlights include a determined, horn-rampant and optimistic Prelude. The Key is a dark cue with middle strings set against their darker brethren with italicised channel separation and a resulting broad sound-stage. One of Herrmann's classic romantic melodies sings out in The Forest borne up by singing violins, propelled on high by horns and counter-sung by sweet woodwind. A superb inspiration. Welcome Aboard is all hustle driven be a dancing waterfront hoedown. The score is unusual in that the last half dozen cues are full of tension and threat until the very end of the finale when the voluptuous strings sing out that grand melody and the horns and other brass add their valedictory paraph. The 23 tracks of the Williamsburg music remind me strongly of Herrmann in his mock Handelian mode - think in terms of his music for the Gulliver's Travels film - Handel's Water Music might be a good parallel with one or two surprising harmonic turns. The disc has a 32-page booklet designed by Jim Titus, with a Herrmann overview by Steven C. Smith and exhaustive cue-by-cue analysis of the two scores by Kevin Scott. 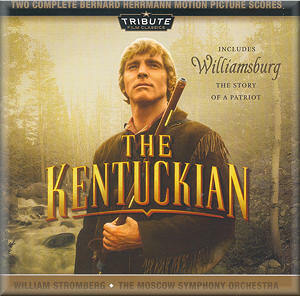 The Kentuckian is the film that has had some airing on TV in the UK. That's more than can be said of the other two feature films represented here. The music for the Ray Bradbury-based book-burning film, Fahrenheit 451 (dir. Francois Truffaut) uses a string orchestra and extensive percussion; the wind being left in the cold as they also are in the atmospheric score for The Nightdigger with its viola d'amore solo. In a world where books are seen as dangerous and are proscribed Guy Montag (played by Oskar Werner) is one of an army of firemen whose duty is to burn all books. Montag job is to burn all printed matter, but when he decides to steal and read a book, his world view turns upside down. He leaves his former way of life and escapes to a new world of 'book people.' Werner and Julie Christie succumb to the lure of the printed word and become dissenters who flee to a doomed world of book people where ideas are still free. The Prelude sounds like the radio telescope music from the score for The Day the Earth Stood Still. Much the same applies to the fantastic tones of TV Signals in which intricate bells ring and tinkle as they also do in TV aerials (tr. 31). The Fire Station has its origins in the Psycho windscreen wiper music. Romance returns for The Bedroom (tr. 12). The swirling attack of percussion and shuddering strings is signature Herrmann in Fire alarm (tr.22). The harps cut and slash at the start and a mysterious tension then takes hold in Vertigo (tr.34). The Flame-thrower movement is a stunning evocation - what a resourceful composer Herrmann was. The Road (tr.45) is wonderfully regretful and carries the nostalgia of Ravel's Pavane. It's a rapturously lovely score. 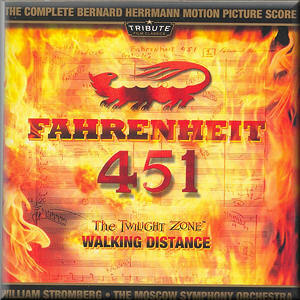 The Walking Distance music has a similar sound-profile to the Fahrenheit 451 score. The Park movement carries silvery etiolated shreds of children's play-songs. The music for the Parents is poignant in contrast to the fear obviously engendered in The House. There is a long string elegy running close to four minutes. This is music fragile yet carrying a steely argent strand. After the spartan simplicity of strings and percussion with harp - though it never seemed that way - of Fahrenheit 451 the full orchestral score for Mysterious Island. Mysterious Island takes the Jules Verne fantasy novel as its point of departure and under producer Charles Schneer and visual effects magician Ray Harryhausen conjures up another fantastic romp. During the American Civil War escaping soldiers escape in a hot air balloon and end up marooned on a remote island where gigantic creatures roam. Pirate and volcanoes add to the wild mix. The crammed full 32 page CD booklet includes reminiscences and essays from Harryhausen, Christopher Young, Bruce Crawford, Gunther Kogebehn, Craig Reardon and Kevin Scott. William Stromberg in this first disc in the Tribute series refers in his wonderfully vivid note to the physical impact of having eight horns and four tubas playing very loudly in front of you. The whole experience must have been overwhelming and you catch a lot of this in this recording which, by the way, is the only disc of the three to present just one score with no fillers. This is the disc that includes cues cut from the film. There are six of them. The whole score is awesome and grand. Listen to the first Clouds cue (tr. 9) where wild high trembling strings are offset by growling grumbling woodwind like some ancient groaning creature. It recalls the noise made by the serpent engulfed in lava in Herrmann's music for Journey to the Centre of the Earth - another Jules Verne fantasy. The spatially-separated fanfares are fantastically exciting and stimulating in The Rocks (tr.16). There are some raindrop gentle moments too as in the harp-decorated Exploration (tr.17). The Giant Crab is portrayed with squat abrasive calls from woodwind and brass and an attack like Stravinsky's The Rite. More gracious lyrical material is carried by the clarinet in RC and Elena (trs.26-27). The Rimsky-meets-de Falla Giant Bee buzzes and hums with just that sense of threat of the fatal sting in trs. 32 and 34. The timpani and cymbals rock the speakers in the Attack at tr. 41. Herrmann was always a master at evoking the oceanic depths and so it proves again with the sinking and groaning low bass and harp ripples in Underwater. The Ship Rising and The Earthquake (trs.59 and 60) take us back to the monumentalism of the early pages of the score. This is music of spectacle and adds immeasurably to the film. Ultimately that is why producers came to Herrmann time and again. The man was a sheer genius at the service of and a prime contributor to the cinematic art. That we can hear and enjoy his music separate from the images it illuminated and to which it lent life - rather than the other way around - is cause for rejoicing. 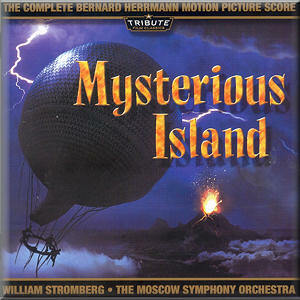 One puzzle with the Mysterious Island disc: my player says 62 tracks yet the book and insert lists only 61. The answer? Each of the three discs carries a 32 page booklet with track-by-track plot and music analysis. They include essays putting the music in the context of the concert and other cinema music of their time and are so substantial that they only just fit into the lugs in the jewel case. These are complete scores with the tracks laid out in chronological plot order. Cues cut from the film are included where the material has survived and these tracks have been interpolated into the assumed correct position had they been used. The tracks are numerous: 61 for Mysterious Island, 48 for The Kentuckian, 47 for Fahrenheit 451. Walking Distance - a classic 1950s episode from The Twilight Zone and Williamsburg - The Story of a Patriot are included as generous and rare fillers. The latter is shown only at two Williamsburg cinemas as part of the historical themed museum at Colonial Williamsburg. It was commissioned with no expense spared and was first screened at the museum theaters in March of 1957. It is reportedly the longest-running motion picture ever: some fifty-three years. It uses a small orchestra. The tracks are at the longest 3.56 and at the shortest 0.11 so there is an inevitable stop-start aspect to the listening experience but it does provide an authentic experience for those who take exception to symphonic syntheses as in the case of Rumon Gamba's equally sumptuous Chandos/BBC Phil Korngold recordings (Sea Wolf and Sea Hawk). The Moscow sessions must have been long and arduous if the crystal clarity and relishable sound is anything to go by; nothing left to chance. Long may Tribute continue their work.